Big Hungry Shelby: Can You Say Tratt-OR-ria? Happy New Year, Big Hungries! I’m not one for resolutions, but I can tell you this, at least my early 2013 needs to contain a little more antipasto and a little less osso bucco; a few more apples and fewer pommes frites. I have been on an eating free-for-all since sometime in August, and the buck stops here. Or maybe it stops Monday. I’ll get it together – I’m trying! Last week, Shawn and I were in Watertown for an extended holiday visit due to a death in the family. This is unfortunate, and I wish Shawn’s loved ones peace and sympathy, but it also afforded us the opportunity to spend lots of time with our people, and to dine at the new Pete’s Trattoria twice in one week! Pete’s is a Watertown institution, of course, and on I’ve discussed with you before. But it was recently sold by the venerable Costanzo clan to Geoff Puccia, of Ives Hill Country Club notoriety, and this was my first chance to hit it up since the changeover. It’s the same old Pete’s inside, and though my parents and I dropped in without reservations on Christmas Eve, the hostess quickly found us a table in the cozy bar area (which had better music anyway! ), in which we received wonderful service from the bartender. 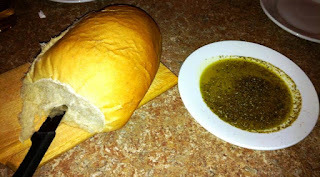 The loaf of bread she brought us as a starter was also an old favorite from the old days, and we enjoyed that classic Italian bread flavor and the chewy but still light texture, dipped in EVOO seasoned with dried thyme, basil, and parsley. 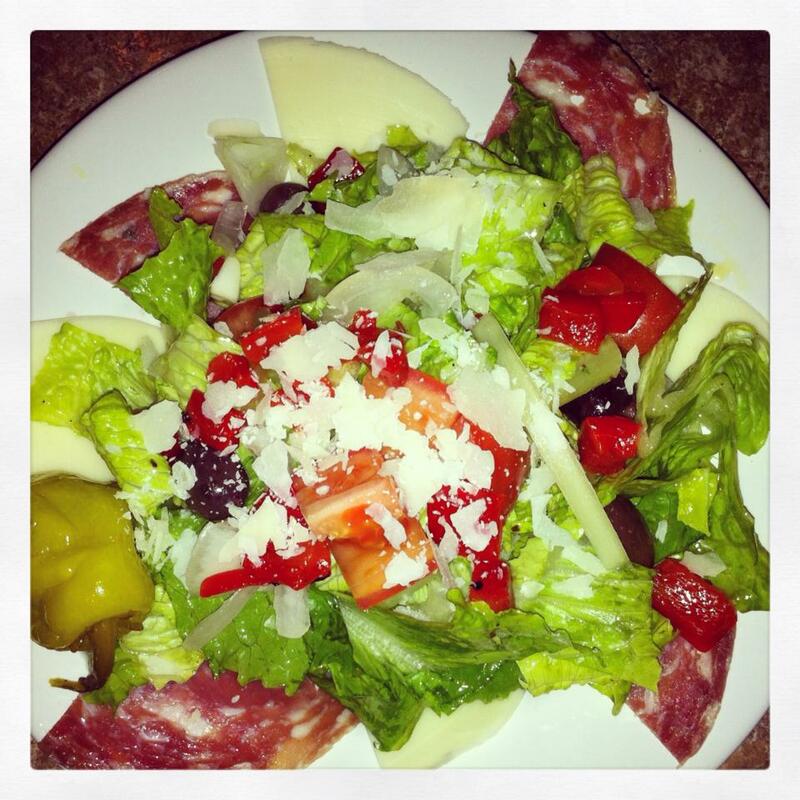 The salad course was an upgrade over most mom and pop Italian joints. Mom and I had the garden salad, with a fabulous, fresh, balsamic dressing that was tangy without too much bite from the acid. Dad’s antipasto had real kalamata olives (rather than boring old canned black olives), a very light vinaigrette, and high quality salami and provolone to round out the greens and roasted red peppers. Natch, my Big Hungry Brain wanted me to order either the osso bucco or the short ribs, but I was really craving something a little lighter. I went with the gnocchi scampi, and was thrilled with the choice. The shrimp itself may have been the best I’ve ever had. It was ultra fresh, but really tasted like shrimp – the sign of a good quality product. The tiny, gorgeous gnocchi were tender, and the buttery garlic sauce crowned with fresh parsley was light but with enough of a punch to catapult the gnocchi into flavortown. Dad’s entrée, eggplant parmesan, was the other star player on our table. I will order this in the future; it was righteous. 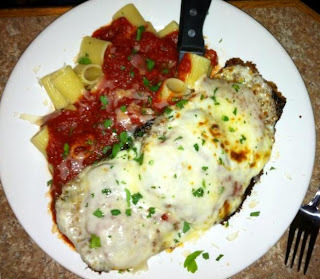 The perfectly seasoned eggplant steak didn’t have a hint of bitterness, the serving was huge, and the sauce was sweet while the cheese was salty – perfection. Mom went old school and ordered the homemade pasta with marinara and meatballs. I didn’t try her meatballs, but she allowed me to sneak a few bites of her sauce, which was fresh and chunky, but without the laziness of some sauces where all you get is raw tomato flavor. 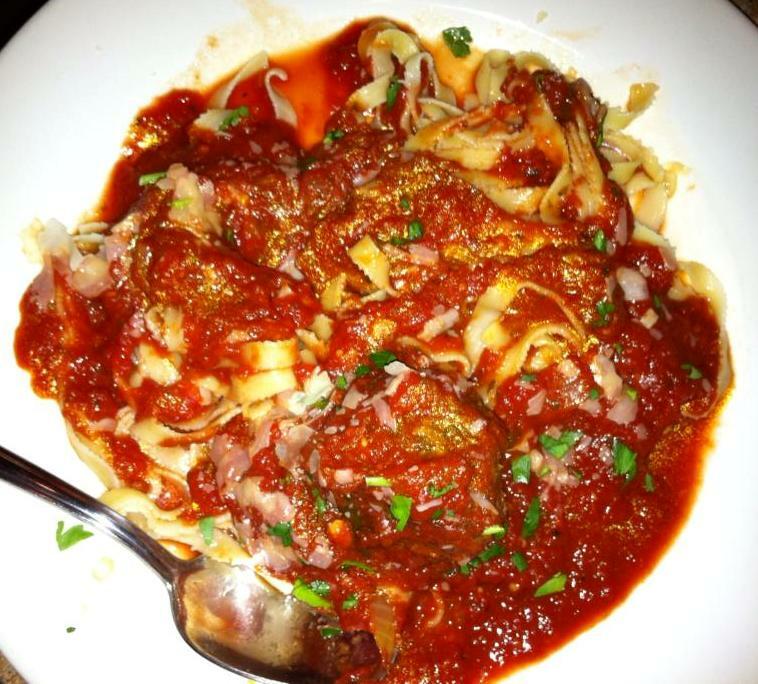 Geoff’s marinara is well seasoned and well-cooked without the all-day, cooked-down flavor of a Sunday sauce. On my return trip, with Shawn, Lance, and his fabulous kids, I decided not to hijack everyone’s dinner and simply concentrate on what I ordered: bruschetta and osso bucco. Both were good, but didn’t hit it out of the park for me like the eggplant and shrimp dishes. 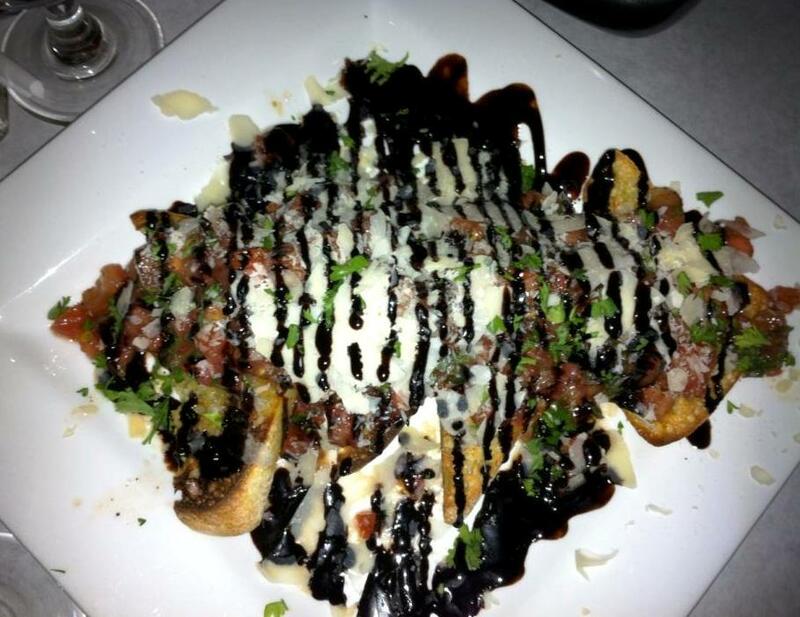 The bruschetta at Pete’s certainly has a lot going on. There’s bread, a traditional tomato topping, cheese, balsamic, herbs, etc. But the balsamic wasn’t quite cooked down enough for me, and the tomatoes were lacking some seasoning. I’m still giving Tony’s in Endicott, the crown for the best bruschetta in Upstate NY. 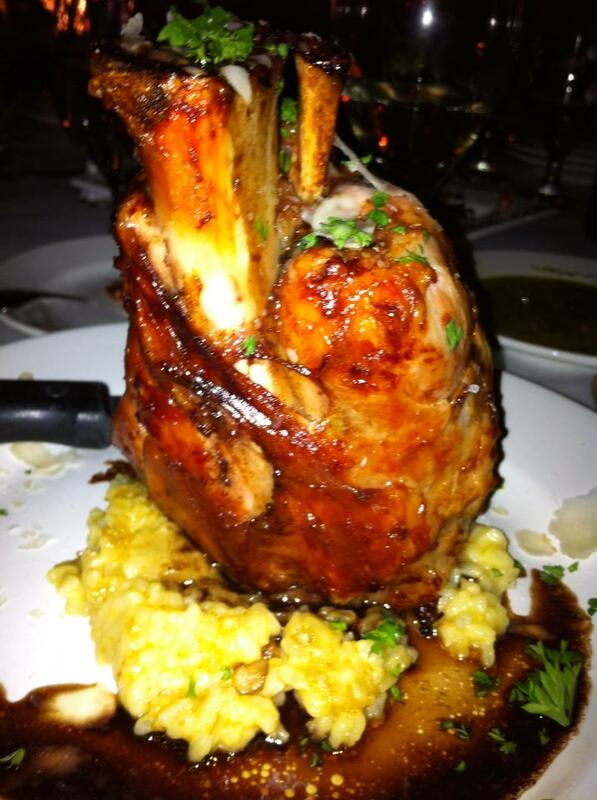 I had really high hopes for the osso bucco, which is made with pork shank rather than veal, at Pete’s. This dish has become one of my favorites, and I’m so glad to see more and more restaurants embracing peasant foods and braised dishes. At first bite, I was enthralled – the demi glace was punchy and robust, and the risotto underneath was al dente, cheesy and salty in a really pleasing way. But I must say: the shank was not braised for long enough, and the texture of the meat suffered for it. While some parts were tender, the connective tissue was still intact to a degree that made parts hard to eat, and the overall shank just hadn’t had enough time to break down to that unctuous, velvety consistency osso bucco needs to be. I have similar high hopes for the short ribs with gorgonzola mashed potatoes and the bone marrow appetizer – neither of which I’ve had a chance to eat as yet, but I’ll let you know when I do. Overall, I was really pleased with both dinners, though I wish my pork would have had another 45 minutes in the oven. The new Pete’s is enjoying some controversy in Watertown. Many, many people dislike change, and loved the simple, old school, Italian-American dishes and Sunday sauce the Costanzo family served up for more than 40 years on Breen Avenue. But you know me, I love change, and if the eggplant parm and gnocchi are indicators of the other pasta dishes on the menu, I don’t see what all the fuss is about – there’s plenty of red sauce-anchored meals here to please the masses! 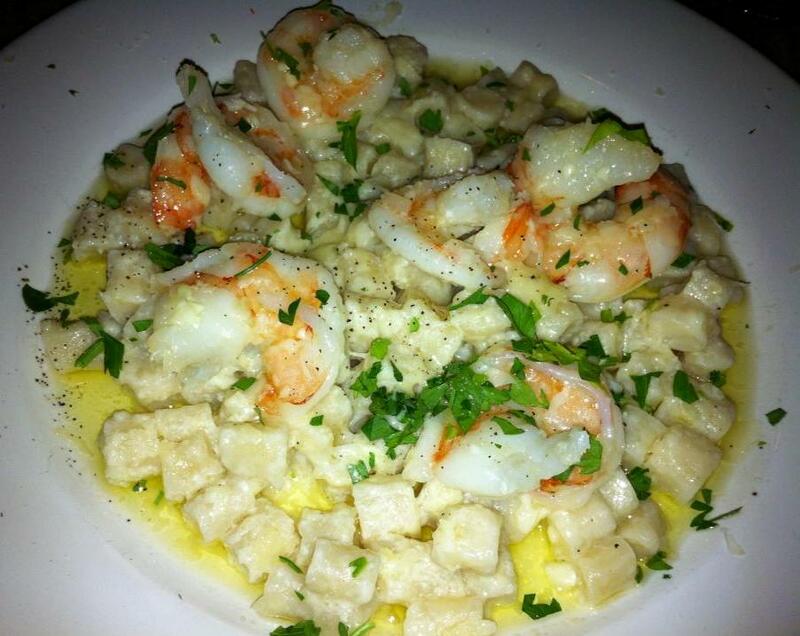 We awarded Pete’s Trattoria an eight on the BHS scale, and I can’t wait to go back and get the bone marrow in my belly! 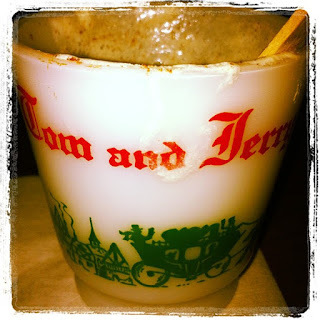 I would also like to report that all of my tom and jerry consumption this year took place at another Watertown institution: The Crystal. And boy, were they delicious! My hunger is big; my personality is bigger!